The idea of mountain bike trails under Interstate 5 in Seattle was first proposed by John Zilly in his book, Kissing the Trail. Later, the Eastlake Community Council proposed it to the community and to the Seattle Department of Parks and Recreation as part of the Pro-Parks Levy I-5 Open Space Park. Simon Lawton of Fluid Ride, a local downhill coaching business, drew up a course that got the mountain bike community excited. Then Backcountry Bicycle Trails Club (BBTC) and Urban Sparks started working to make it happen. Urban Sparks assembled the I-5 Trails coalition, a who’s who of Seattle cycling, which showed solidarity in the cycling community and ultimately earned us permission to build the trails. Our letters of support below show the success that we’re quite proud of. Once we received permission to proceed and the city negotiated the lease with the state, we kicked the project off with the round walled gathering area, funded by the Neighborhood matching fund. The I-5 Colonnade is the first of its kind – an outdoor covered technical terrain park for skill building. 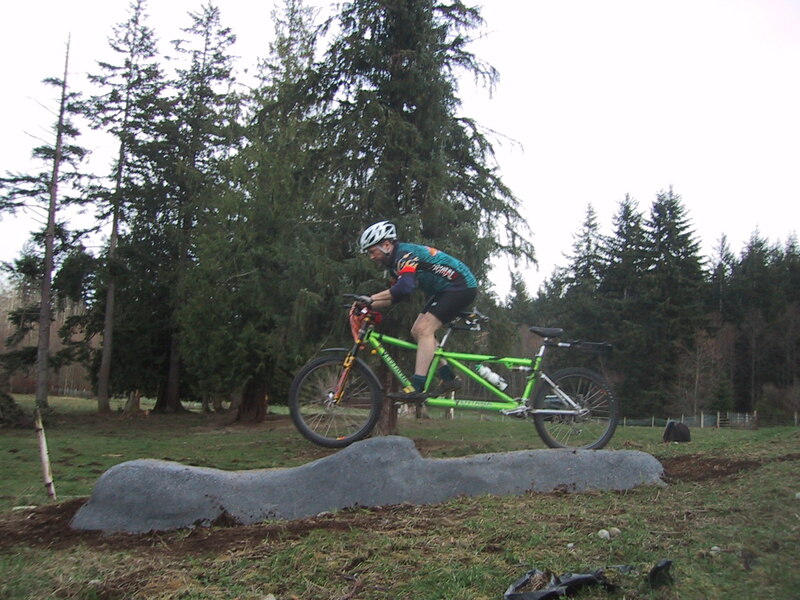 While figuring out how to artfully squeeze 2 miles of interesting trails and bike toys into the nooks and crannies of this park, we built a Faux Rock that can be ridden from multiple directions. Features like this help pack a lot of fun into a relatively small urban park. We also hope to put compact features like this in local parks throughout the city so each neighborhood has a place to meet and play on their bicycles. See also: Bicycle Skills Parks. To help maintain this park, contact The Evergreen Mountain Bike Alliance.